When three former cops commit suicide, private investigator Alec Santana knows it’s not a coincidence. An ex-cop inexplicably commits suicide in Miami, and his widow turns to her husband’s best friend, Alec Santana, for assistance. Soon after, two more ex-cops commit suicide. After talking to one of the widows, Santana discovers they all had a single event in common: they responded to a Christmas Eve fire almost fifteen years ago. Threatening letters turn up, prompting Alec to dig deeper into events from the past. He knows he’s on the right track but things turn dangerous as someone tries to run him off the road. The police refuse to help, insisting there’s no connection between the suicides and recent accidents. We all have someone in our lives that we look up to and have the utmost respect for. When it comes to author Ernesto Patino's main character, Alec Santana, that individual is Ben Brody. So when he finds out that Ben has committed suicide with no apparent reason, Ben’s wife comes to Alec to help her make sense of it all. 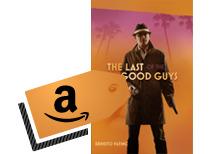 Written in the skillful way that Ernesto Patino has developed when it comes to a great story, The last of the Good Guys helps us to see what some will do to cover up a secret or keep the past buried. Loved this book... This was a great read for the sumer or anytime you are looking for a tightly woven mystery that keeps that pages turning"
Who doesn't like a great mystery story? Ernesto Patino may not be a well known mystery author...yet. But he has written another great book that I truly enjoyed. I read one of his earlier books last year titled Web of Secrets and was looking forward to reading this new one...This is a small book and read it in one sitting...The story was enjoyable, it kept my attention, from start to finish, and I would definitely read other books written by Ernesto Patino." Ernesto Patino has a unique way of taking a story and filling it with twists and turns all mixed together in a smooth blend. It is this rare quality of his work that keeps the reader on the edge of the seat and makes a page turner of them. His story in The Last of the Good Guys starts out strong, peaking the reader's interest, keeping it elevated throughout the book then crescendos into an all time high with a surprise ending you can't possibly see coming. Patino is a master of storytelling and I highly recommend this book."